A family gathers for dinner, and a father asks his teenage daughter to say a prayer to bless the food. She takes a deep breath, and tells her family she’s not comfortable saying grace because she’s no longer sure if she believes in God. A stunned, concerned silence falls over the table as she explains, “If there’s a God, why are people hungry? Why is there cancer? Why do babies die? It’s a line packed with humor, love and honesty—all of which are hallmarks of ABC’s hit sitcom Black-ish. What follows the dinner table discussion is an episode-long exploration of what it means to be a believer, the role of faith within a family and how to ask big questions. It’s thoughtful, nuanced and, yes, really, really funny. And it’s the kind of scene that is playing out each week on one of TV’s most acclaimed shows. Black-ish is, in large part, the brainchild of actor and comedian Anthony Anderson, who is the show’s star, narrator and executive producer. For him, scenes like that are important, not only because they feature conversations that can’t be found anywhere else in primetime, but also because he feels called “to impart the gift I’ve been blessed with.” That “gift” is the ability to create a show that does more than just entertain; it can cause people to think about and see the world differently. “My faith and my belief in that is what keeps me going,” he says. Anderson has a way of acknowledging the impact the show is having while still deflecting the praise onto things like a God-given gift. The more you talk to him, the more you get the sense he’d personally rather not get the glory for its success. Note that his answer never gets to how he makes Black-ish so good. That’s not how Anderson thinks. He sees himself as part of a broad and diverse community. If he takes any credit for the fact that Black-ish pushes the very idea of black representation to the forefront of primetime on a weekly basis, he never says so. And the more you talk to him, the clearer it becomes that this very humility is the key to Anderson’s success. 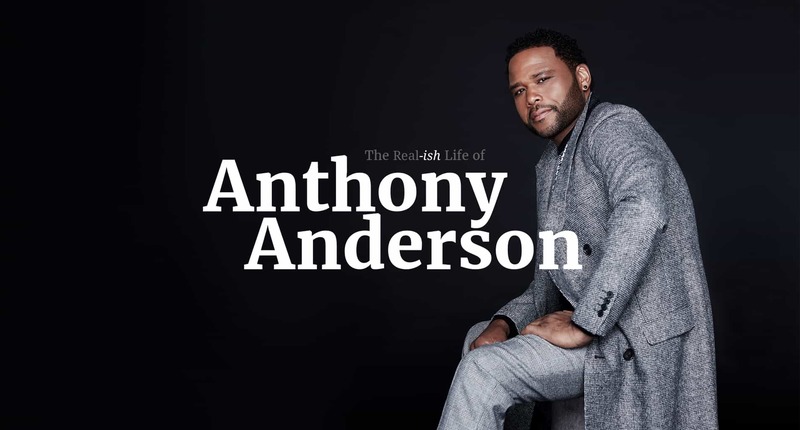 Anthony Anderson was born in Compton, California, the son of a mother who worked as a telephone operator and a father who ran a chain of clothing stores. Anderson started acting early, getting cast in a spate of guest appearances on shows like Ally McBeal and In the House before finding steadier work in The Bernie Mac Show and Til Death. He was, like a lot of people struggling to make it in the industry, getting by without ever really getting ahead—but he was never deterred, partly because of his belief in God. It’s this gift that inspired him and his friend, writer and producer Kenya Barris, to take a chance, and try something completely different than what was currently on primetime TV. Anderson speaks with a lot of affection for Lear, the legendary American writer who created television shows like Sanford and Sons, The Jeffersons and All in the Family, and who married comedy with social commentary in a way that hadn’t been done before him. It was incisive without being off-putting and opinionated without being alienating. It was, in other words, the sort of show that’s in short supply since Lear’s glory days. That was something Anderson and Barris wanted to change. The show stars Anderson as Andre Johnson, a well-off advertising executive with a large, loving family; a lot of feelings about life in the 21st century; and not enough people interested in hearing them. The show turns Dre into sort of a semi-unreliable narrator in his own story, mulling over his opinions on social issues and family life. In this sense, the premise is not so different from dozens of other network sitcoms featuring hapless husbands and the life lessons they learn and impart. What sets Black-ish apart is the gravity of the issues Dre wrestled with and the nuance with which they’re all handled. Anderson has a story about Paul Lee, the man who was president of ABC Entertainment Group at the time Black-ish was picked up by the network. Anderson says that he and Barris pitched the show to five channels and got five offers, but it was Lee’s faith in the show that led them to ABC. Lee brought Anderson into his office and made him a promise. That was back before anyone actually thought Trump had a shot at winning the presidency. When asked how having a vocal critic of the show in the White House has elevated the pressure, Anderson is honest but not overly perturbed. That said, Anderson is aware that the tensions around the sort of issues Black-ish deals with—like racism, sexism and bigotry—have grown tighter and become a larger part of the national spotlight in the four years since Black-ish premiered. He’s mindful of the fact that many people come to his show expecting to see something real—and lately, reality in America requires a very different hand than it did even four years ago. Anderson is an empathetic guy, and that empathy has lent Black-ish one of its most engaging qualities: an interest in exploring multiple viewpoints without ever feeling like it’s refusing to take a side. Dealing with “it all” and trying to do so while including every point of view is no small order, and according to Anderson, the key to doing it well starts with who you hire to create the show in the first place. And what happens in the writers room, according to Anderson, is something that maybe should be happening more outside of it. For people who watch Black-ish, the line between Anderson and the character he plays seems very thin. For Anderson himself, it’s even thinner. He calls Dre an “amalgamation” of himself and Kenya Barris. He takes that relationship very seriously, and it’s one of the few areas in which he’s willing to talk about himself, specifically, and the meaning that being a spiritual person holds for him. When asked how he wants to be remembered, Anderson answers so quickly and confidently that this interviewer took to Google to see if he’d memorized some famous speech (He had not.). Once again, he pulls the conversation away from himself. He deflects. He wants to talk about making sure the next generation is just as memorable.